Simmering Bearnaise sauce, Chasseur or a richly-seasoned marinara, this All-Clad saucepan is unsurpassed in even-heating performance. 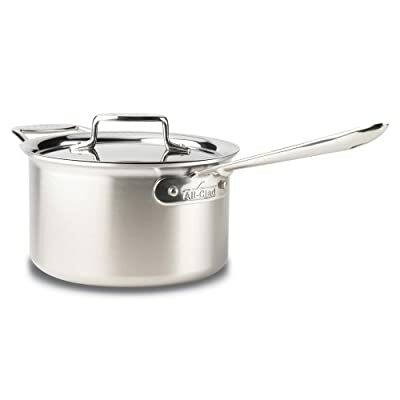 The best in American craftsmanship from the inventor of metal-bonded cookware, this All-Clad d5 brushed stainless-steel saucepan ensures smooth flavorful sauces. Engineered with 5 layers of custom-formulated metals: 18/10 stainless-steel interior, bonded to aluminum, stainless-steel, aluminum and stainless-steel exterior that extends up the sides for unprecedented heat distribution. 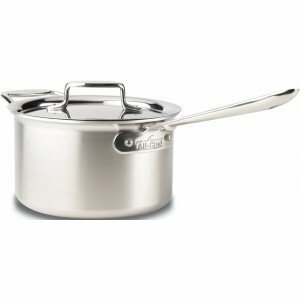 A noticeable difference while simmering sauce, pudding or dipping sauce, this All-Clad d5 stainless-steel saucepan is 20% more efficient than tri-ply, to achieve gourmet cooking results using lower heat setting. For easy identification, the All-Clad brand and capacity/measurement are provided on the outer base of each piece. Dripless rim on this All-Clad saucepan ensures easy, mess-free pouring. Ergonomic handle with finger guard provides balanced control, a definite advantage when handling multiple pans on the stove top or in the oven. The 18/10 stainless-steel interior will not react with food, leaving the pure taste you desire. Magnetic exterior is perfect for all cooktops, including induction. Dishwasher-safe. Lid and pan made in the USA.